Samsung took the wraps off its Smart Home service at CES in January this year, and today it is rolling out the service in Korea and the US. More countries will be added throughout the year. Samsung Smart Home ties together smart TVs and home appliances to a smartphone so you can control devices simultaneously via an app. For example, a user can say “good night” to the TV remote control, and other connected devices within the home such as the Smart Bulb and air-conditioners could be set up to automatically switch off. 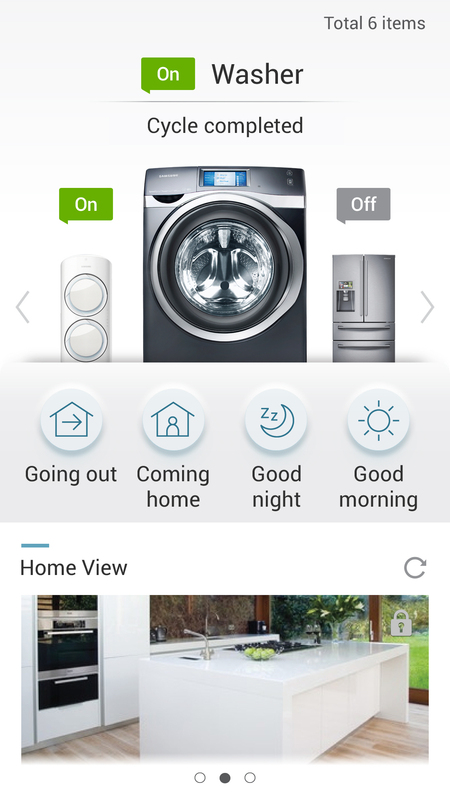 The app also allows you to check the status of home appliances when you’re outside. For example, you can control the washer and select settings for the laundry to be ready just when you reach your doorstep. Users can register for the Samsung Smart Home app with their Samsung account — and they can download it now from Samsung Apps and Google Play. A separate Smart Home app will be available “soon” for one of Samsung’s wearable devices, the Gear 2, while another app for Samsung’s 2014 Smart TV models will be available in April. To assure users of security, Samsung notes that all data transmitted by its app is encrypted. Going forward, Samsung’s president and head of the media solution center, WonPyo Hong, says that the company has plans to expand the Smart Home service to areas with “high growth potential” including home safety and energy management. It also intends to extend it to other smart products, including the recently announced Smart Bulb as well as robot vacuum cleaners and another wearable device, the Samsung Gear Fit.